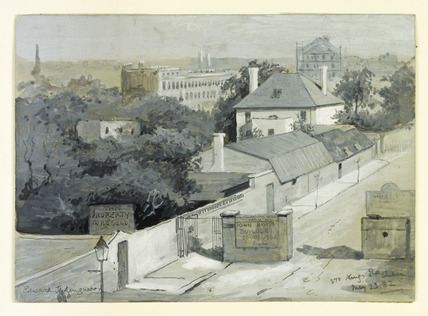 Manresa Road - seen from the King's Road, Chelsea, looking north towards the Brompton Hospital. These building were demolished in the 1920s. Home to the Manresa Road artist's colony from 1878. John Brass, whose name appears on a signboard, was the local builder who developed Chelsea's first speculative studio complexes in Manresa Road. In 1878, he erected Trafalgar Studios which provided accommodation for 15 artists in the 3 storey factory-like structure seen in the distance. This venture was so successful that in 1886, Brass gave up his own neighboring villa to build Wentworth Studios which offered a further 8 studio units.